﻿Remember the story of Hansel & Gretel? Hansel attempts to mark a trail home using bread crumbs in the forest — not the smartest move in the presence of hungry birds. And definitely not recommended if heading out on one of our many coastal walks. Marine intertidal snails, however, are smarter than Hansel. In a habitat where their environment fluctuates constantly with tidal movements, they find their way back to their safe nooks and tide pool homes by using a substance better than bread crumbs. It’s a substance that nothing would want to digest and that also holds a longer shelf-life than abandoned food around wild birds. They leave behind a trail of slime. This sticky substance adheres to the rocks as they glide across, allowing them to turn around when their feeding times are done and follow their footsteps back home (to the same tidepool every time!). With this proven method of marking their way, some west coast snails live 80 years. Yup, mucus is useful. This substance so many of us find revolting is a source of protection to many animals, a way to help digest their food, even in some cases a way of attracting mates. In snails and sea slugs (nudibranchs), each species has a unique chemical composition to their slime, and within each species, individuals can even be identified. Studies have found that individuals follow the trails of members of their own species in order to reduce how much mucus they need to produce and thereby saving energy. Males also use slime trails to locate females. Trace chemicals embedded in the slime can be used to identify between genders — the males then stalk females by gliding along the mucus the ladies leave behind them. Romantic. These molluscs also use this slime to protect themselves. Some species have chemical compounds that while underwater advertise toxicity, but, ironically, above water smell incredible. The hooded nudibranch for example smells like watermelons when disturbed; the sea lemon smells like lemons. Smelling them above water is likely the only time someone would be tempted to eat such a goopy creature. In the aquarium, disturbing an orange-peel nudibranch will leave you with such a thick layer of mucus on your skin that butter knives or rough scrubbers are needed for its removal. Yet, while they smell good to us, these aromatic chemicals are a warning system to potential predators; they’ll do more harm than good when digested. The mucus coating of their bodies is also used during low tide, when it prevents deadly dehydration and simultaneously allows them to exchange oxygen between their skin and the air. Gunnels are members of a small group of intertidal fishes that also use this method to breathe out of water. Turning over a stone in the lower intertidal zone may reward you with a sight of these long eel-like fishes, but please replace the stone. Even with their slime coat, they will dehydrate and die in direct sunlight. Sea stars are also slime lovers. One is even dubbed the ‘Slime star’. This sea star is softer-bodied than its shallower-water relatives. They’re able to survive with this vulnerability by sliming when disturbed. A few that have been accidentally bothered while cleaning tanks in the aquarium have displayed this behaviour. It isn’t possible to see the boundary between the sea water and slime, but the viscous gloop is practically impenetrable. When irritated, this sea star can appear to be hovering, floating above the substrate in an invisible bubble. They have to be kept separate from fishes, since the dense mucus would clog the gills of fish and cause them to suffocate if kept in the same display (imagine drowning in mucus, not fun). Leather stars are a second species that flourish due to their productive mucus glands. Although not as vigorous as the slime stars in their mucus generation, the leather stars are aided by the intense smell of their slime. Garlic. Thick, pungent garlic. Like the sea slugs, this is used to advertise the fact that if digested, they would definitely taste very very bad. Many animals use slimes during reproduction. Moon snails use this to fabricate the egg casings sometimes found scattered on the beach. Feeling like plastic, thousands of tiny eggs are mixed with slime from the snail’s body and sand to provide structure. The egg collar is left behind allowing the eggs to begin development in the sea water, and are gradually released as the mucus breaks down. It’s hard to believe that such a smooth, fine structure was produced by a snail! When snails mate, the slime coating provides a mode of transportation for the eggs and sperm which are exchanged. Snails are hermaphrodites, meaning that each individual carries both sperm and egg producing organs. Mating, in their cases, means an exchange of sperm from both individuals, and the mucus provides a way for the transfer to take place. Feeling insecure about your mucus producing abilities? Like most vertebrate species we humans have very few uses for our mucus. For other species, slimes are multi-sensational. Tactile, olfactory and... in the odd case, often accidentally, gustatory. Whether protecting their bodies or attracting new lovers, mucus is there for the invertebrate, and occasional fish. Come by to see some of these amazing functions in action! The aquarium is open daily 10am – 6pm. (And situated next door to the ongoing construction of our new building). 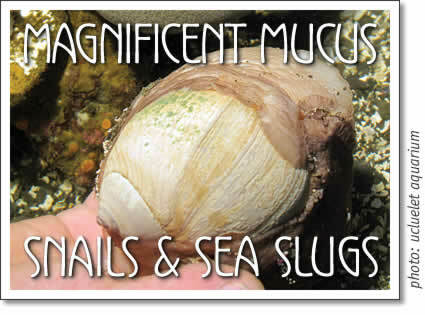 Magnificent Mucus: Marine intertidal snails and sea slugs are featured at the Ucluelet Aquarium.